The signs at Hannover main station welcome you to the trade fair town. A proud statement that is evidenced by the 131 hectares of space that I visited earlier this year for the industrial technology trade fair. President Obama decided to as well, touting the US manufacturing industry, as the key sponsor to this bi-annual event. I toured the modern, functional halls, 26 in total, discovering block upon block of tooling, engineering and regional German state offerings, displaying products, services and new innovations. The Germans are the world champions of trade fairs, 2000 will be held in 2016, way ahead of USA with 1146, China with 592. In fact more Germans go to trade fairs than go to watch the German football league, another field they are world champions in. So why are the Germans way ahead of the rest? Perhaps because they were the first to establish the idea. In 1165 Leipzig formed the first trading fair, where the local rulers set a precedent of only allowing local traders to trade within a mile radius of the town. And after the 2nd World War it was the British military that established Hannover as an export trade fair to support West German manufacturing that has now become the biggest trade fair site in the world. So how does Great Britain fair in comparison? In Hannover I couldn’t find any British manufacturers, which is a reflection perhaps of an economy that now focuses on service industries however, in 2016 the UK exhibited 589 trade fairs putting it in 4th place. That puts it above England’s, Wales, Scotland’s and Northern Ireland’s world cup football ranking and is frankly a fair performance. 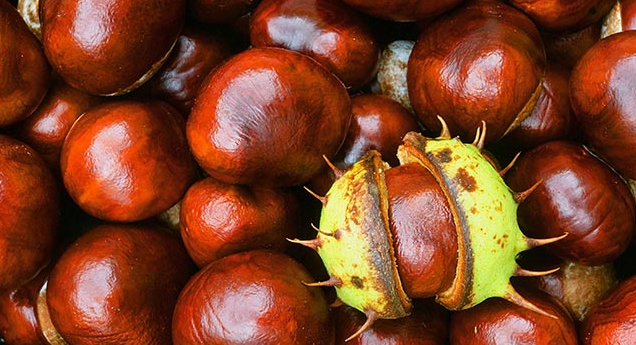 October in Britain heralds the coming of the conker season. This time honoured tradition of collecting the largest and potentially strongest conkers, hardening them by drying either on a radiator or in an oven, and then threading them with string, is seen as the most important game of the month in every school playground. And in October there are two official tournaments on the Island, the first being the World Conker Championship in Ashton Northamptonshire which started in 1965 and attracts audiences of some 5000 people, and the second the Scottish Conker Championships in the Tweed Valley. The rules of the game vary but the goal is to smash the opponents conker to bits by hitting it with your own, which requires good eye-hand coordination and a certain amount of nerve. And what happens when the conkers fall in Germany? Not surprisingly they are put to an altogether more creative and less competitive pastime. Kastanienmännchen or conker figures are animal or human figures constructed and created with matchsticks or wire. The different shapes of the conkers are used to create the body parts of the figures and this apparently not only develops the children’s dexterity but also their creative skills. So does this difference offer an insight into both cultures? Maybe. The British are good at making games and the Germans are good at making things. I travel on the German national rail network twice a week, mostly between Hamburg and Berlin but also to other major cities, so I get plenty of time to take in the view. And often what you see on the city outskirts are Kleingartens or allotments either squeezed between the roads and rails or backing onto the lines. But the allotments in Germany differ from the English ones and it got me wondering why this is so. German Kleingartens (small gardens) typically have a well manicured lawn with hedges or fences dividing the properties. Each plot has a small building which resembles a house not a shed, with sloping tiled roof, windows, patio, satellite dish and flag pole for the national or regional flag. The houses even have toilets and kitchens, and there are a strict set of legal rules to adhere to within the Kleingarten community. In England the allotments are more utilitarian and used for growing vegetables, they have small sheds that only house the gardening tools and often the plots are divided by wire or narrow raised grass path. 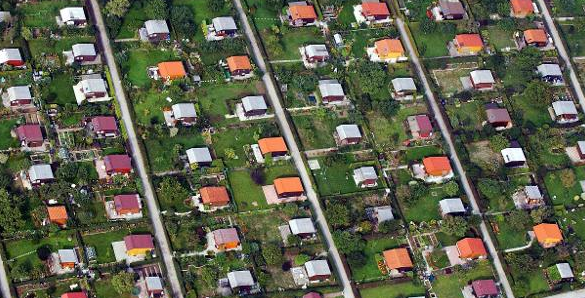 Most people who live in German cities rent apartments. This means they have no gardens with the traditional lawn and herbaceous borders. At best they may have a balcony, so there was a greater need for allotments to be used for relaxation and to let people appreciate the outdoors. In English cities, more people live in houses that have gardens and therefore allotments have traditionally been used to grow food and not to relax in. England also has a tradition and history for landscape gardening and people model their gardens enthusiastically on the latest gardening trend or design, so there is less desire to do this on an allotment. And furthermore there is a higher single property ownership rate in England and less dependency on renting, so that maybe another reason why there are around a million rented Kleingartens in Germany and only 80,000 rented allotments in England. Being a regular traveller on the Deutsche Bahn (German National Railways) has made me familiar with the landscape in Northern Germany particularly Brandenburg and Sachsen-Anhalt. This is a flat and in places marshy land, with scattered trees and copses that in the winter reveals large nests of mistletoe. Although the evergreen globules are parasitic, it is difficult not to see them as a decorative touch to an otherwise bare winter landscape. Across the English Channel, I’ve rarely come across mistletoe in its natural habitat. Instead, Christmas sees clusters of mistletoe hang from ceilings or door arches in churches, houses, pubs and universities. This ancient tradition dating back to the Druid times, was meant to bring good luck and to ward off evil spirits. Nowadays the English tend to use it to hide their inhibitions and kiss each other underneath it, whilst removing one of the berries, a tradition handed down by Norse mythology. 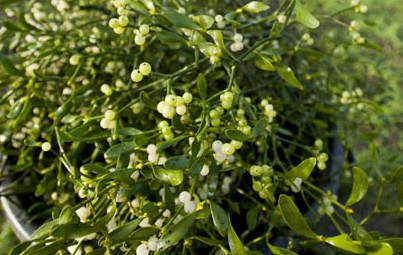 And not unusally, if you go far enough back the Germanic and English roots of the word Mistletoe are intertwined (pardon the pun). Mistel derives from Old High or Middle High German probably meaning dung, and toe from tån meaning stick in Old English. Which makes sense if you taste the berry and look at the plant and means it’s best advised to leave it hanging in the tree or from the door frame at Christmas time and not to sample it with the wine. 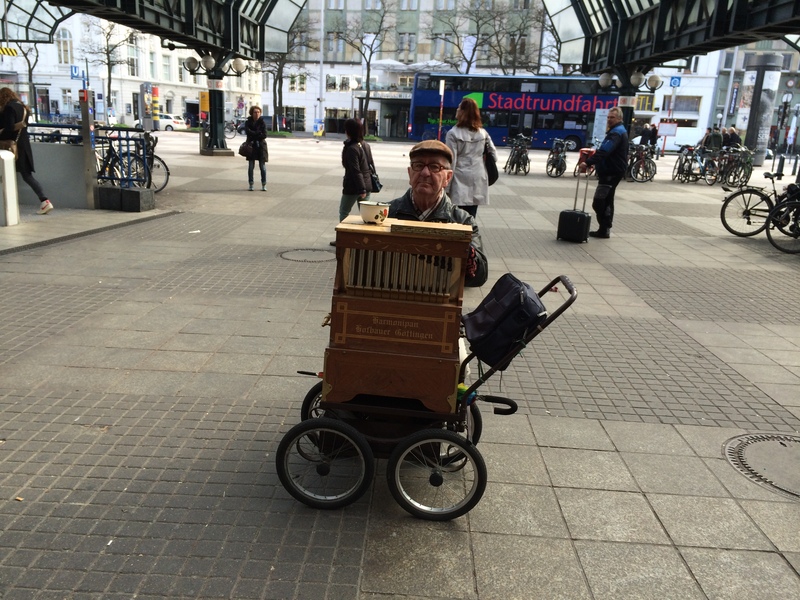 Coming out of Hamburg main station via the north exit you are occasionally greeted by a sound rarely heard these days: the trickle of tunes from a barrel organ. With his old-world instrument and the music of a bygone era, the organ grinder is not like the ordinary busker. I paused to listen (and to take a picture, and spare him some change), and wondered why this tradition has persisted in Germany, but not in England. The riddle was not solved with a quick Wikipedia search. However, from what I can gather, the reason for one country’s abandonment and the other’s continued appreciation lie in the particular circumstances of the barrel organ’s invention and later uses. It is not known when the barrel organ, or ‘Drehorgel’, was invented, but the first mention of such an instrument is from 1650, in the writings of the German Jesuit priest Athanasius Kirchner (1601-1680). It appears that these mechanical instruments were often produced by the same craftsmen, many of them German, who also made the great church organs. The organ business was, in other words, a continental, and often German, speciality. 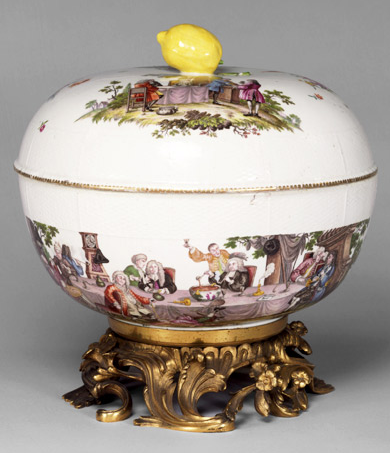 Portable organs made their way to England in the 18th Century. However, throughout the 19th and 20th centuries local authorities often banned the public playing of them. The players would simply grind out the same tune over and over again, being more of a nuisance than anything else. The derogatively named ‘organ grinders’ could hardly be blamed, though. They rented rather than owned the instrument, which were often of poor quality and with limited ability to change tunes. In Germany it was perhaps a different matter: here there were well-produced organs, owned by their players, who consequently also had a much greater interest in their upkeep. Fast forward to today, and a detailed internet search will show you that there are just six recommended street organ makers in England; in Germany, the picture is very different with over one hundred manufacturers. You might say that with such a long history of craftsmanship and being the so-called home of the street organ, it is hardly surprising that some organ makers still manage to grind out a living. Every year in February, exactly 40 days before Easter Sunday, organised Spass (fun) on a grand scale takes over the cities of Cologne, Dusseldorf and Mainz. It is carnival time, and should you not be able to make it to either of these cities you need not miss out: the stage shows and processions of floats are broadcasted live on national television, for what seems like days on end. Frankly, it all leaves me a little bewildered. Trying to make sense of the many activities is difficult, but one repeated feature is the men in mock military costumes. These representatives of the carnival societies preside over the various ceremonies – like the official beginning of the carnival year, and the crowning of the king and queen of the carnival. For the televised shows they are seated on stage, introducing and commenting on the acts of well-fed cancan dancers, squeaky-voiced ventriloquists and Schlager bands. The audience, also in fancy dress, has their part to play too. 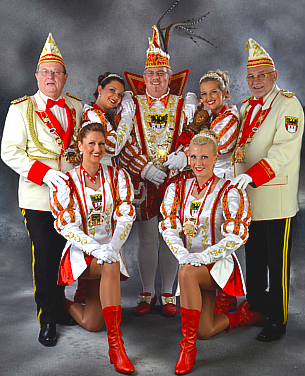 Acts are interspersed with chants, songs and rhymes, impossible to decipher for those unfamiliar with Rheinland carnival rituals and the local dialect. Though even to the outsider, it is clear that the carnival is more about repetition and ritual, rather than the unexpected. Indeed, years of practice have gone into the performance. I am reliably informed by the official German carnival website that in 1823 Cologne organised the world’s first carnival parade. Before that, in the Middle Ages, the farewell to meat (‘carne vale’) at the beginning Lent was an often boisterous and wild affair. By the nineteenth century such spirits had been calmed by modern sensibilities, though, and something like what we know today began to take shape. It would appear that the uniforms, for all their garish splendour, epitomise the organised style of carnival: they lend the event the air of a well-planned military campaign. However, it is important to point out that these costumes were at least in their conception meant to poke fun: they signify local protest against the regimentation and control of the military forces that occupied the region, the French 1794 to 1814, and the Prussians thereafter. But is it possible to put on a uniform, and stay true to the carnival spirit? After all, in spite of the original message these outfits are now part of the structure that brings order to chaos. Is this all fun at the push of a button, then, a yearly repetition of well-worn jokes – a few days release, forgotten again until next year? More to the point, is it really fun? To judge it properly you have to understand the jokes, the rituals and the dialect of the Rheinland. It’s not for general consumption. Compare it to, say, Shrove Tuesday, when the Brits kick off Lent by dressing up as old women and race each other with frying pans whilst trying to toss pancakes. Is that more fun? Not really, just less organised.